TGIM (thank goodness it’s Monday), I know people are use to TGIF, but I wanted to change things up here a bit. I’m so happy that it’s Monday and also so very happy that my kids are back in school. Yippee! I really enjoyed having them at home last week, but honestly I didn’t accomplish a single thing. I didn’t cook anything new or get any work done on my blog. It was a nice and much needed vacation for all of us, but I am ready to get back to work and ready to cook again! Routine works best for me as I’m a creature of habit. I honestly missed cooking for my family and I missed my “mommy” healthy lunches. We were on-the-go so much last week that I either crammed a PB& J in my mouth for lunch or we ate out. I can only eat out so many times before it gets old and I really like eating at home. Home cooked meals are usually healthier and the portions are smaller. I find that we eat way more when we go out to dinner as opposed to eating in. The portions that these restaurants serve these days are enormous. What’s up with that? Anyway, here I am talking about portions and healthy eating as I am showcasing this utterly decadent and chocolaty dessert. Doesn’t make much sense does it? This is definitely the easiest dessert in my recipe book. Now, it does need to chill for 2 to 3 hours before serving, so it does require a tiny bit of planning, but the preparation couldn’t be easier, so easy in fact that your child could make this entire dessert! You might have to supervise on the coffee pouring part, but otherwise it’s easy-peasey-lemon-squeezey (that is another one of my favorite sayings)! Serve this dessert up at your next dinner party and your guests will be impressed. They will think you spent all day slaving over this dessert, when all you actually did was throw 5 ingredients into a blender and blend away (shhhh… they never have to know how easy it was). This dessert is very rich so you will definitely want to add some fresh whipped cream to the top. 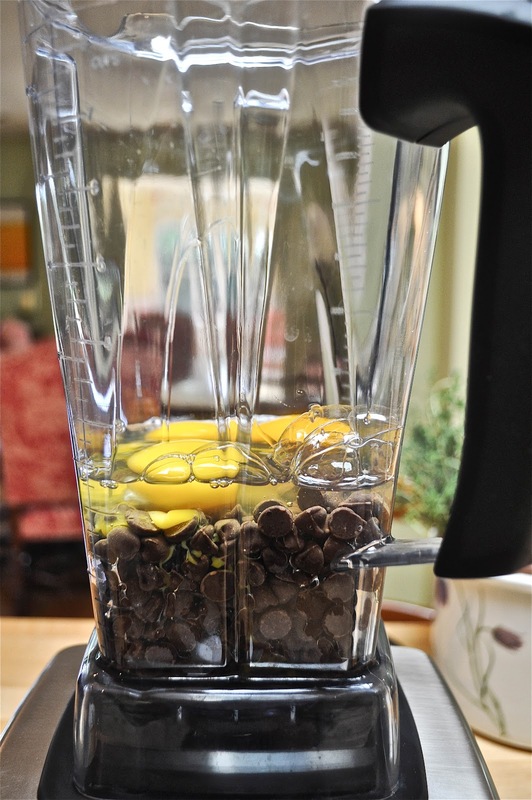 Place the chocolate chips in the blender. Crack in the 4 eggs and then add the pinch of salt and the 2 teaspoons of vanilla. Blend all the ingredients together till combined. Grab some very hot freshly brewed coffee—as in, hot-hot—and slowly drizzle it through the hole in the blender lid while the blender’s on. The mixture will slowly expand and rise in the blender, but do not fret, just keep the blender on a low speed while adding the coffee. 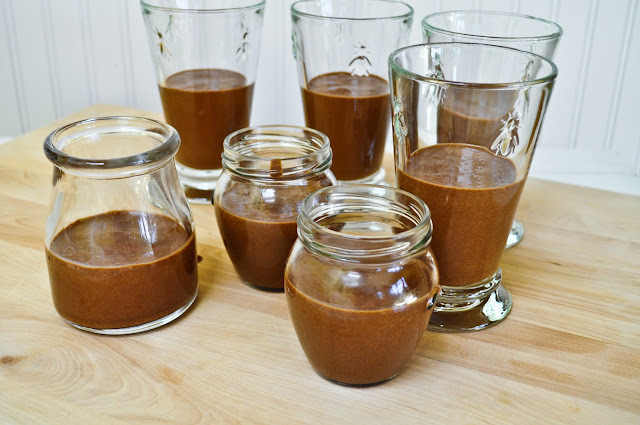 Once the coffee is added, put the top back on the lid and blend away until the mixture is pureed and smooth. Note: The coffee will heat the eggs so you will not be eating a raw egg dessert. 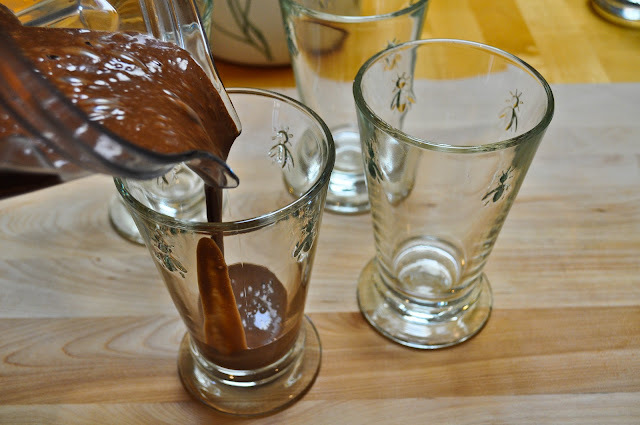 Pour the mixture into some glasses, small mason jars or ramekins. You can use whatever you desire. I actually used some 9oz glasses and some recycled jam jars. I actually loved the way they looked in the recycled jam jars. Place the glasses and jars in the refrigerator and refrigerate them for 2 to 3 hours, or until firm. Now you just need to add some whipped cream to top these off. This whipped cream is the perfect topping for any dessert from chocolate mousse to pumpkin pie. I even use it to top ice-cream sundaes! Note: Whipped cream is best served fresh, so if you’re just serving dessert for your family then you may want to cut the above recipe in half. Beat the cream in a large bowl with an electric mixer at medium speed until it becomes frothy. Add the sugar and vanilla and continue beating until the cream holds soft peaks. When you’re ready to serve up the pots de creme just place a fresh dollop of whipped cream on each one! You could also be fancy and add some chocolate shavings on top. These are rich little desserts so don’t make your portions too big. I actually had to cover and refrigerate mine for the next day as I was stuffed halfway through eating it. My kids devoured theirs though! Eli was even licking his glass. Here’s to a fancy no fuss dessert! these are SO gorgeous!! So delicious and LOVELY recipe. I can SO relate to your joy of Monday!!! 3 of mine were home last week and the other one is starting 2 weeks off next week!!!!!! 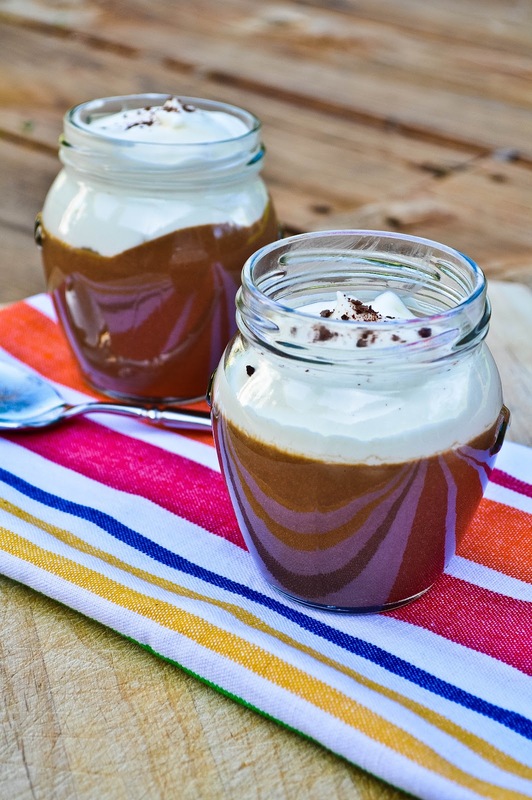 These creme pots are great entertaining idea! 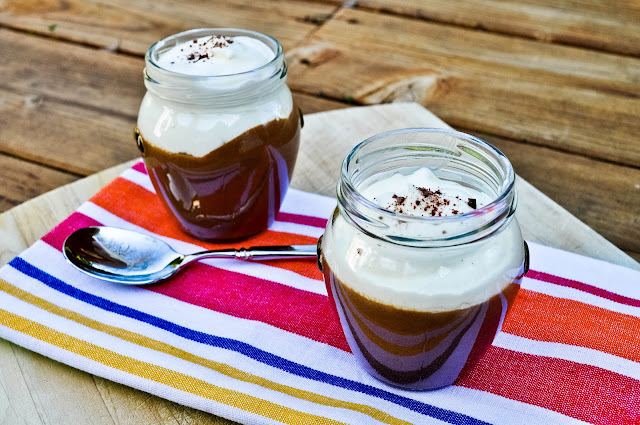 What a chic plus an indulgent way to serve this chocolate-y and creamy dessert! They are so pretty!! I love creme pots so much!! 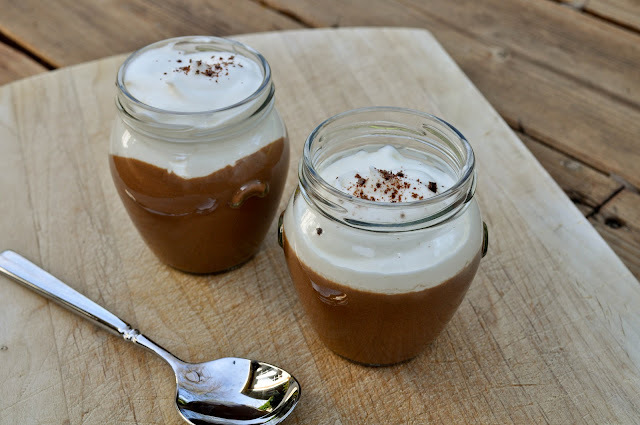 I also like to sometimes make them without chocolate (like fruit creme pots or similar). You can get away with using really little sugar and so, although they are pretty rich still with all the eggs and cream, they aren’t too carb heavy and feel like a more balanced dessert to have after a really carby meal (if that makes any sense?!). Sometimes having cake or something AFTER pizza/ pasta just feels like too much! I’ve been wanting to make pots de creme ever since I started seeing posts about them! Yours look delicious. Wow – they look so pretty and delicious.